Thanks to legislation such as the Building Regulations and the Energy-related Products (ErP) Directive, we have long seen a development towards highly efficient heating products. But there is more to an efficient boiler than just its theoretical efficiency figures according to its data sheet – correct setup, operation, service and maintenance are just as important, explains Stuart Turner. The enforcement of the ErP Directive in the space heating sector in 2015 was the dawn of a new era. A shift from atmospheric to condensing boilers has taken place, as the former cannot meet the efficiency requirements as set out by the ErP Directive. Like for like replacements have become increasingly difficult. Space-saving modular boilers have gained popularity. 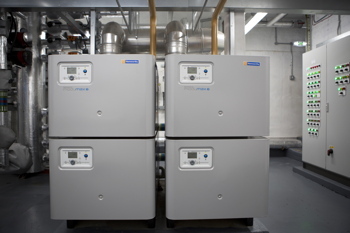 Instead of a system supplied by a single large output boiler no matter the heating requirements, several smaller boiler modules in cascade arrangements can provide the same output. A low water content compared to the larger boiler allows a quick heat up time. Additionally, rather than a simple on/off function, modern boilers benefit from in-built advanced controls with large turndown ratios (maximum to minimum ratio of output) to allow close load matching. Turndown ratios of multiple boilers multiply across the entire installation. In a typical modular boiler system, each boiler module could have a turndown ratio of 5 to 1, so a vertical stack of 3 modules will have 15 to 1 turndown. When heating requirements are high, several smaller boilers can run at a more energy efficient state (part load) together than one higher output boiler alone at full load. However, it is necessary that controls are set to regulate themselves automatically, rather than being set to “on hand”. This allows a system to work to its optimum ability. In the case of condensing boilers, operating temperature and return temperature then come into play. Condensing boilers are most efficient when they ‘are able to’ condense. That’s why it is even more important to have a wide temperature differential with low return temperature to ensure it is operating in condensing mode. In multiple boiler arrangements, the boilers can be set to operate in different modes. In unison control, each boiler module is switched on and operating at its lowest rate until all modules are firing. Then, all boilers are modulated simultaneously to higher rates to match the system load which offers higher operating efficiencies. When set to cascade control, a boiler module is operating at its lowest rate and then modulates to its maximum rate before switching on the next boiler module. 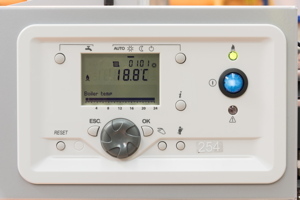 The controller alternates operation of boilers to ensure even use which helps the long-term reliability of the system. A concern for many building operators is also continuous heat supply in times of boiler breakdown or planned maintenance. During servicing, boiler modules can take over for the ones that are worked on giving continuous heat supply - especially of importance for buildings with vulnerable residents such as the elderly in care homes or hospital patients. A site survey offered by many manufacturers can help to determine the current system and assess which boiler would be best suited to the application. Sometimes existing heating/hot water systems are oversized to cover for worst case scenarios. With higher efficiency boilers, it is however often possible to reduce the overall number of boilers which not only frees space on site, but also lowers energy use, capital, and maintenance costs. An isolated view of merely looking at a product’s energy efficiency label will not make an efficient heating system. Even a new boiler can work inefficiently if it is not set up the way it is intended to be. A site survey allows you to see if energy savings can be achieved by upgrading and possibly changing the number of required boilers if the system is currently oversized. To make full use of modern condensing boilers’ capabilities such as a high turndown, multiple boiler installations are an ideal choice. This allows close load matching without wasteful cycling contrary to single large output boilers which essentially run on an “all or nothing” principle. By using multiple boilers, a continuous heat supply is ensured even if modules need to be serviced. Stuart Turner is National Sales Manager at Hamworthy Heating.